The above screenshot shows a preview of what the top of the homepage will look like. 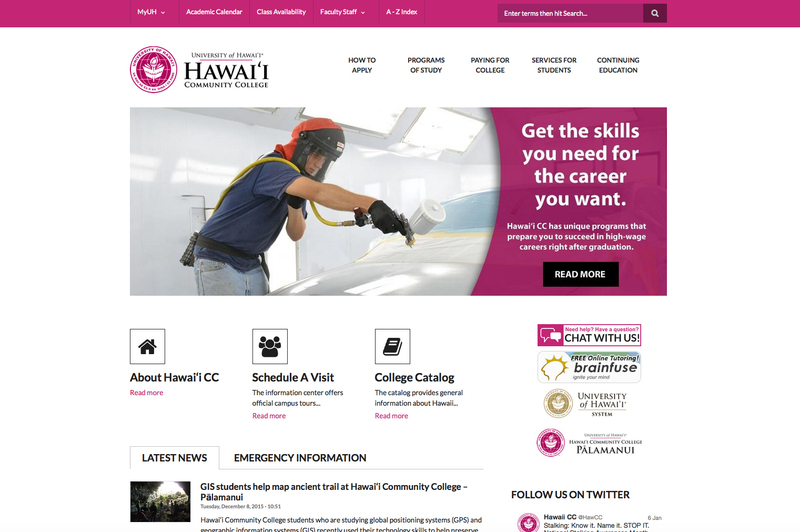 Hawai‘i Community College will soon have a new website that provides a cleaner look, a better platform for celebrating the success of Hawai‘i CC students, and easier navigation for prospective students and other visitors. 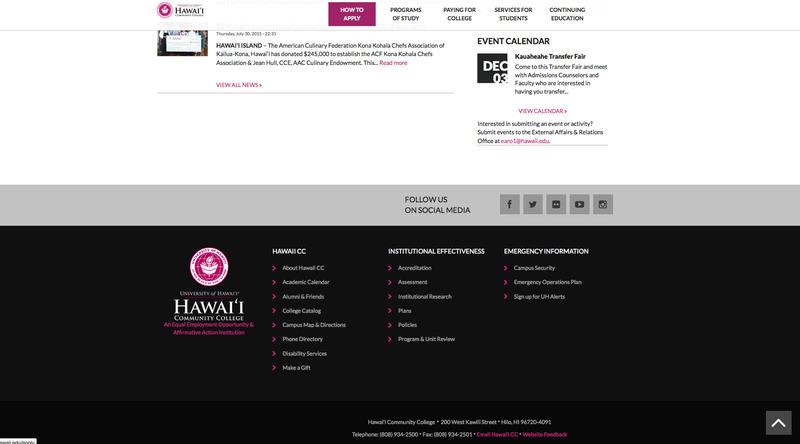 Hawai‘i CC web developer Daniel Fernandez has been developing the site in collaboration with members of the college Administration team, members of the college’s Strategic Enrollment Management team, the Office of External Affairs and College Relations, the University of Hawai‘i Community Colleges Marketing Committee, and others. This screenshot shows the website’s “footer,” which will appear on every page and includes many institutional links for faculty and staff. The site will use the Drupal content management system and Drupal’s “Scholarly” template that was designed specifically for colleges and universities. The website redesign is part of a broader effort to bring a level of uniformity to the UHCC sites. The main navigation tabs at the top of the page, including “How to Apply,” “Programs of Study,” and “Paying for College” were agreed-upon terms adopted by the UHCC system. The shared navigation terms are the result of a request by Vice President for Community Colleges John Morton that the UHCC campuses make it as easy as possible to visit our seven community college campuses online. The above screenshot shows the navigation tabs that will guide visits to some of the major sections of the website.